Things that don’t belong to you. Books or DVDs you’ve borrowed (from friends or the library), the platter left behind after a dinner party, the sunglasses left after a BBQ, the blow-up mattress you borrowed when guests stayed over. Typically, these are scattered all over the house. Often they (quite embarrassingly) go missing. Things that need to be repaired or returned. These are in the laundry, in the junk drawer, in the wardrobe, the shed, the spare room and the office. And they never get fixed because you forget they exist. Things that need a decision to be made. This is most usually paperwork, but often there are items floating around that need decisions, such as carpet samples, a gift you don’t like, clothes that don’t fit, or a project you’ve abandoned but not discarded. Once you’ve identified these items, create a home for them, and make some rules around what fits into each category. A home for things that belong to others can be a shelf in a living room cabinet, or a clearly labelled box in the spare room. A special spot in the bookcase or bedside table is perfect for borrowed books. 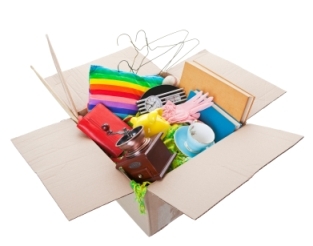 A box near the back or front door would also be good for things that need repair, or drawers if you have a lot (note: if you have a lot, consider throwing some of them out – especially if they’ve been damaged a long time and you haven’t needed them). Things that need a decision to be made should also be grouped together. This one needs to be more obvious, because it will probably be the largest category. An inability, or a delay, in making decisions is a key cause of clutter. I’d use an open shelf with everything on display (paperwork should be stored vertically – in manila folders or magazine files). Then they’re reminding you of the decision that needs to be made. Create a boundary – decide just how much space you’re prepared to sacrifice for these items, then stick to it. If you exceed those boundaries, it’s decision time!